Sample-import gripes aside, Addictive Trigger makes replacing drum elements fast and simple, if not literally addictive. Gets quick results. Impressive spectral beat detection. Extensive processing. Ready-made kit presets. Supports AD2 sounds and presets. No way to expand sounds if you don't own AD2. 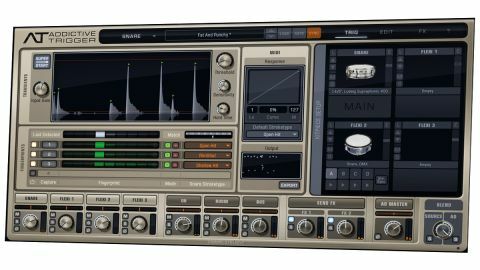 Addictive Trigger (VST/AU/AAX) is a drum replacement plugin from the company behind Addictive Drums 2 and Addictive Keys, the main focus of which is replacing single sounds on individual kick drum, snare drum and tom tom tracks within multitrack drum recordings. It's a plugin of two halves: detection and replacement. The former detects drum hits using Threshold, Sensitivity and Hold time controls, combined with XLN's newly developed FFT-based spectral analysis system, Audio Fingerprint. This, it is claimed, is capable of very accurate hit detection, even with lots of mic bleed or background noise. Audio Fingerprints can be manually captured on the fly or by selecting a portion of waveform in the real-time Transient display. Additionally, the time-saving SuperStart feature will scan incoming audio and automatically set up all detection settings, including one Audio Fingerprint based on the strongest detected transient. The drum replacement side comes courtesy of the Addictive Drums 2 engine. You set your Main drum type (Kick, Snare or Tom 1 to 4) in the top bar, then layer up to four Kitpieces (the Main one plus three 'Flexi' pieces chosen from any of the included sounds) for triggering when the detection threshold is exceeded, and use the global output Blend to mix them with the source sound. Tweaking options for each Kitpiece layer include Pitch, Volume Envelope, Cut filter (combined high-and low-pass) and Velocity response. Beyond that, processing is done using the full Addictive Drums 2 insert effects chain, comprising Noise, Compressor/Distortion, EQ, Tape simulation and Saturation. Onboard ambience is handled by two auxiliary effects busses, and the Overhead and Room channels, with send levels for each Kitpiece. Addictive Trigger includes six acoustic kicks, six acoustic snares, and four sets of toms (with four toms in each), plus one DMX-style electronic kit and a few extra sounds (tambourine, handclaps, etc). If you own Addictive Drums 2, its sounds and presets are automatically made available in Addictive Trigger. Unfortunately, there's no other way to add extra sounds; there is a MIDI Export function, but no live MIDI output. Individual sounds can be loaded and edited from scratch, but there are also 48 Kit Presets, incorporating insert and send settings for all six Kitpieces (Kick, Snare and all four Toms). The Preset Sync option loads the same Kit Preset into any plugin instances in the project with the Sync button activated, making it quick and easy to set up a consistent soundset across a full kit. Audio Fingerprints incorporate a couple more significant features. First, Snare Stroketype uses the four available Audio Fingerprints to access up to four of six snare articulations (Open, Rimshot, SideStick, etc.) Secondly, they can be set to Reject mode, where the strongest hits are ignored - most helpful for isolating and replacing weaker hits in full kit signals. In use, the plugin delivers superb triggering accuracy. There's 100ms of latency involved due to the FFT processing involved, but since the plugin is aimed squarely at replacing existing recorded tracks in a mix context - as opposed to live drum triggering - that's no big deal. Addictive Trigger is a focussed plugin that may not have broad appeal but is brilliantly implemented, powerful and extremely easy to use. The inability to load your own sounds in is a major drawback, though.